Now Inkling has found his way into Hank's apartment on his quest for squash, a bandapat favorite. But Hank has bigger problems than helping Inkling fend off maniac doggies and searching for pumpkins: Bruno Gillicut is a lunch-stealing, dirtbug caveperson and he's got to be stopped. And who better to help stand up to a bully than an invisible friend? 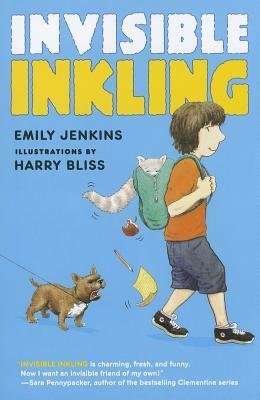 Emily Jenkins is the author of two previous books about Hank and Inkling. She also wrote the chapter books Toys Go Out, Toy Dance Party, and Toys Come Home, plus a lot of picture books, including Lemonade in Winter, That New Animal, and Skunkdog. She bakes excellent pumpkin bread and, when swimming, wears a purple swim cap and blue goggles. INVISIBLE INKLING is charming, fresh, and funny. Now I want an invisible friend of my own!